During the period of Middleborough's most rapid growth in the last half of the nineteenth century, the Middleboro Gazette was but one of a number of periodicals published at Middleborough. 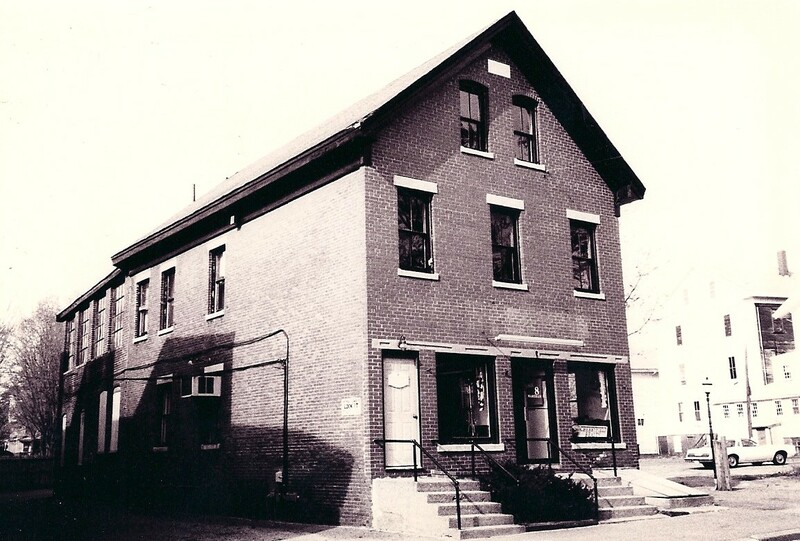 Others including the Middleboro News, Washburn’s Fireside Journal, and People’s Fireside Journal along with the Gazette, formed a fraternity motivated by shared interests and common challenges. The dramatic increase in literacy in America in the first half of the nineteenth century was accompanied by a correspondingly large increase in the number of newspapers and journals directed towards the new general reading public. Among them were The Old Colony Democrat edited and published by Benjamin Drew, which appeared about 1832 in Middleborough, having moved from Plymouth, and was reputedly the town's first, though possibly second, newspaper, and The Namasket Gazette, the forerunner of today's Middleboro Gazette, begun in 1852 by Samuel P. Brown, also at Middleborough Four Corners. At the time of the Gazette's foundation, Middleborough, in general - and Middleborough Four Corners, in particular - was in the first flush of an economic boom brought about by the arrival of the railroad in 1846. By the 1850s, it was clear to the prescient observer that the Four Corners was emerging as the predominant village in town, its growth outstripping and itself supplanting older villages like the Green and Muttock. In 1852, the year the Gazette was first published, Middleborough Four Corners was the locale of Peirce Academy, the Central Baptist and Congregational Churches, and the industrial works at the Upper Factory on the Nemasket River, while not far distant were the eighteenth century townhouse, railroad depot, and Lower Factory mills. By mid-century, land prices at what would become Middleborough Center had skyrocketed, yet despite this, commercial, industrial, spiritual and municipal activities and interests were inexorably gravitating towards the intersection of Main, Center and Water (now Wareham) Streets and the town seemed poised for fantastic and unfettered residential growth. Accompanying this expansion was the creation of both a local reading public hungry for new journals, and the establishment of printing firms - most notably Harlow & Thatcher on Middleborough's emerging West Side - ready to print these journals, or at least provide the technical expertise to do so. The market for varied reading material locally was readily apparent, and it is not coincidental that it was during this period that local private libraries such as those of Peirce Academy and the Central Baptist Church Sunday School and commercial lending libraries funded through public subscription including those of S. Williams (1857) and Robinson Bros. (1872) were founded, as were the Middleboro Library, and ultimately in 1875, the Middleborough Public Library. Namasket Gazette, original masthead, October 7, 1852. It is hardly surprising then, that with this ready market for new reading materials existing within a milieu dominated by expectations of commercial and residential growth, that a number of newspapers and journals would be established to cater to both readers and potential advertisers, particularly following the Civil War. The journals published at Middleborough during the 1870s and 1880s, ultimately formed what one of them would term a "plumbago-consuming fraternity", an allusion to the local print industry's demand for lead for the production of its print type, while the foremost among them – the Middleboro Gazette and the Middleboro News - would together help define the shape of modern Middleborough. In fact, though both newspapers would struggle throughout the post-bellum period to find newsworthy items to print and would rely heavily upon the liberal generosity of advertisers, most importantly they together would articulate a desire for and promote a vision of a better Middleborough and, in so doing, would help define the future of the community. In October, 1875, it was reported that a local religious paper called the Gospel Messenger was to commence publication at Middleborough, though whether it ever did so is not readily apparent. The following December, it was "whispered that there is to be a new paper printed here by Messrs. Harlow & Thatcher, the printers of this place." This was, no doubt, the Bay State Enterprise, the self-proclaimed mission of which was to "astonish the nation and all creation." Though the first issue was to have been published on January 6, 1876, for some inexplicable reason the proposal, in the words of Plymouth's Old Colony Memorial, "a complete failure," and the newspaper seems never to have appeared. 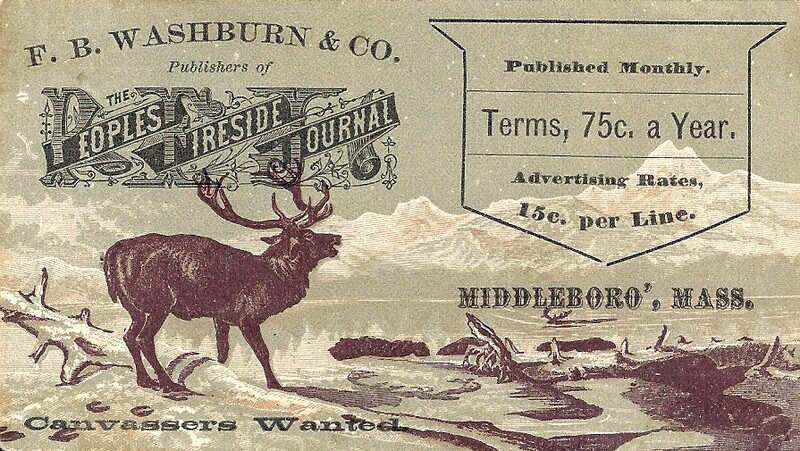 A more successful venture, however, was the 1878 establishment of the People's Fireside Journal, an eight-page "literary paper" published by Silas W. Deane and F. B. Washburn of Middleborough. 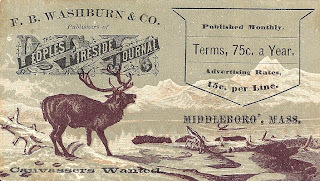 The Fireside Journal had evolved from Washburn's earlier eponymous Washburn's Monthly Journal, printed as early as 1876 on the corner of Center and School Streets, a self-described monthly journal of "music and general miscellany". Commenting upon the Fireside Journal's inaugural issue in 1878, the Plymouth Old Colony Memorial enthused: "The first number is excellent, and if we may judge from this it will be a success." And so it was. Two years following its foundation, Deane disposed of his interest in the Journal to his partner, Washburn, who conducted the paper "under the same general plan as before." The paper, a miscellany of literary matter of varying quality with an appeal to a more genteel reader, remained at Middleborough through the spring of 1884 when it was relocated to Boston with aspirations of a wider readership. 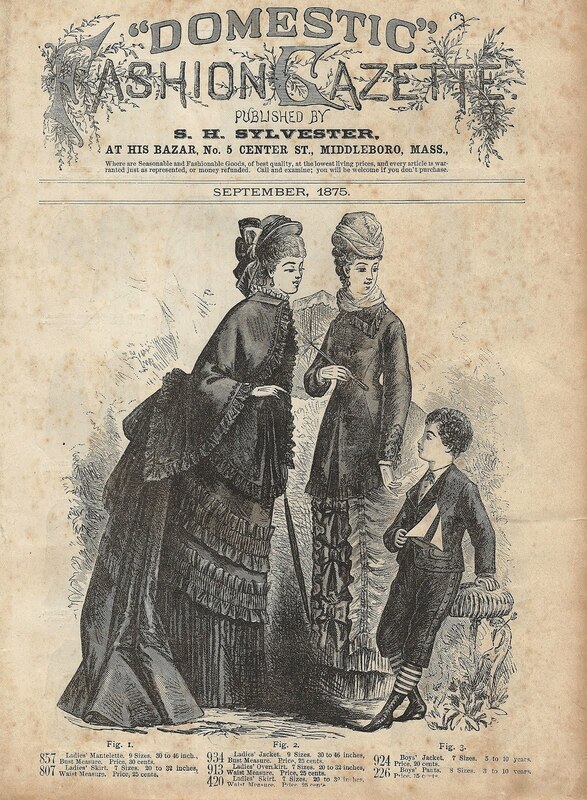 "Domestic" Fashion Gazette, S. H.
Also published during this period was Solomon H. Sylvester’s “Domestic” Fashion Gazette which though intended primarily as an advertising vehicle for his “bazaar” on Center Street, provided images of and news on the latest women’s fashions which otherwise was not available in the community. 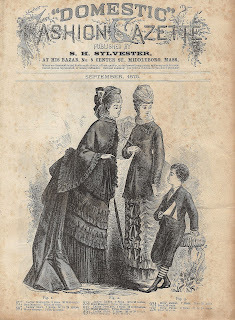 The Fashion Gazette remained popular in the mid-1870s and was ultimately responsible for providing Sylvester’s son with a rudimentary understanding of local publishing. Though published at Middleborough, such literary and religious journals sought to appeal to a wider audience beyond the boundaries of the town, and so had very little bearing upon the community. Not so with the Middleboro News, a newspaper established in 1881 by Henry H. Sylvester as a direct competitor of the Gazette for the patronage of Middleborough advertisers and readers, alike. Sylvester (1859-1900) had early learned the fundamentals of journalism from his father, Solomon H. Sylvester, a Middleborough barber, taxidermist, and merchant, and one-time contributor to the Old Colony Memorial, while the more technical aspects of printing were acquired in Harlow & Thatcher's print shop. The younger Sylvester quit Harlow & Thatcher for a position as a contributor of Middleborough news items to the Old Colony Memorial and writer for the Barnstable Patriot. In early 1880, Sylvester acquired an interest in the Provincetown Advocate, but returned to Middleborough to found the News the following year. He was just 22 at the time. Though few copies of the Middleboro News survive, excerpts from it reprinted in other local newspapers provide little indication that it was very distinct from the older Gazette. The similarity was probably deliberate. The Gazette's mix of local and national news, literary excerpts, religious and political filler, and local boosterism, all stamped with a marked social conservatism, had found a ready appeal with local readers. By October, 1859, just seven years after its establishment, the Gazette could boast, "We have not only the largest subscription list of any paper in Plymouth County, but we have the vanity to believe it is the best." The Gazette's popularity was well noted, and it was deemed "a local paper so acceptable as to find its way into all but a very few families in town". Such success permitted the Gazette to expand in size, install a new cylinder press in 1878, and, most conspicuously, purchase a substantial brick business block on what is now Wareham Street to house its offices in 1882, whereupon the newspaper abandoned its rented and cramped former quarters on Center Street. Additionally, the newspaper financed the completion of a comfortable house for its owner and editor, James M. Coombs, on South Main Street in 1877. Clearly, the News sought to emulate the success of the older newspaper. Like the Gazette, the News was socially conservative in outlook, complaining of fox hunts and fishing trips conducted locally on the Sabbath. The Gazette in 1881 had similarly fussed about clambakes being held on Sundays, and had sarcastically suggested in 1887 that church sextons wear slippers rather than squeaky boots so as not to disturb sleep-inclined churchgoers. A second similarity between Middleborough's two newspapers and one undoubtedly not anticipated by the News upon its foundation was the challenge of a perpetual dearth of news throughout the period. As early as 1876 the Gazette had grappled with this problem. "Middleboro is so hard up for news that the fact of a physician's being seen riding out is reported; also that the greenhouse of one of the residents is occasionally visited for the purchase of choice bouquets." In response, the paper offered a copy of Webster's dictionary or a complete set of Gibbons' History of England to the person contributing the greatest number of local news items during the course of the year. At the News, Sylvester's own frustration with this aspect of the news business was equally evident. In August, 1883, he commented that "it is harder to flatten [a fly] with a rolled copy of the News than it is to introduce water works into Middleboro, or move the county buildings from Plymouth," two notoriously elusive projects which the News supported. Nonetheless, advertisers remained plentiful, and they would provide the mainstay for both the News and the Gazette which were the few advertising vehicles available at the time. Advertising revenue would long support the editorial efforts of both newspapers, despite their struggle for newsworthy items to report, and each would actively solicit local businessmen to fill their advertising columns. The Gazette, with characteristic humor, explained to potential advertisers in February, 1872, that "trying to do business without advertising is like winking at a pretty girl through a pair of green goggles. You know what you are doing, but nobody else does." 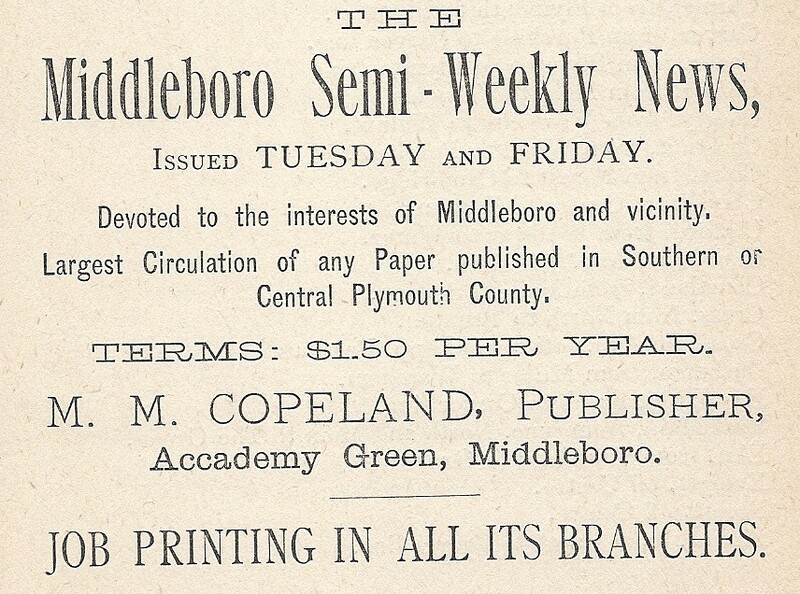 Yet, despite the preponderance of advertising, the columns of the Middleboro News, like those of the Gazette were also filled with the many contributions of local writers. In February, 1885, the News began to carry an agricultural column penned by Elbridge Cushman of Lakeville, President of the Plymouth County Agricultural Society and member of the State Board of Agriculture, "so valuable a contributor." Cushman was a noted local authority upon agriculture and his column lent a certain level of prestige and authority to the News on agricultural matters, despite his sharp criticism of the state agriculture commissioner in just his very second column. The Gazette meanwhile continued to fill its columns with historical matter. Since its inception in 1852, the Gazette had published numerous items concerning local history and lore, and Stillman B. Pratt had, in 1867, published his historical register of Plymouth County which included a short history of Middleborough. Many Gazette items from this period recounted Middleborough's past with the greatest number coming from Granville Temple Sproat who helped foster what would become a tradition of historical writing for the Gazette. In April, 1885, the News began being issued as a semi-weekly, appearing on Tuesdays and Fridays, primarily to accommodate a glut of advertising, and this greater frequency of publication proved a noteworthy success. News, however, still remained scarce. "If the party who stole the geranium and pot from Center Street a few nights since, will call at the house, they can have the saucer belonging to the pot." Though items such as this from the summer of 1885 demonstrated the News' desperation for "newsworthy" copy, it also revealed Sylvester's humorous nature, a characteristic for which he was well remembered. The situation was no easier at the Gazette. In March of that same year, "the Middleboro Gazette commenting on the quietness of the town at present, says that a person after inspection of the village, came to the conclusion that it was a good place to set a hen, as the chances were she wouldn't be disturbed." 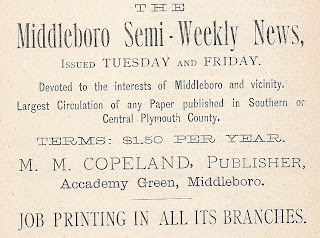 Middleboro Semi-Weekly News, advertisement, 1889.
continue to be known informally as the News. The following April, 1886, Sylvester departed the News in order to take a position with the East Boston Free Press, though he retained ownership until November, 1886. Sylvester's replacement as editor was Marcus M. Copeland of the Wareham Times who served in that post until July when he was replaced by William H. Wood, who ultimately purchased the paper from Sylvester. (Copeland would eventually return a short time later to resume charge of the News). Wood, still grappling with a lack of news worthy of reporting, solicited items from his readers, asking particularly that they submit birth and marriage notices - "it is just the news your wives and sisters like to read." Though publication of such notices and other social items proved popular, hard news stories still remained scant. Advertising, on the other hand, remained the driving force behind the newspaper and within a year, Wood had expanded the Friday edition to six pages - "the increase being on account of crowded advertising columns." Advertising remained the salvation of both the News and the Gazette during lean news periods, so much so that editor Wood of the News was not above chiding local businesses for not advertising, and he refused, at one point, to mention non advertisers by name. "Sign of Spring; that our business men are having their wagons varnished so they reflect your face. Our painters don't advertise, so for fear of stirring up jealousy we refrain from saying whose shop they come from" (1887). Both newspapers, as well, relied to a greater or lesser degree upon job printing contracts, competing with the print shop of Henry L. Thatcher which had, ironically, given the News its start. Though the value of both the Gazette and the News as advertising mediums and news purveyors was clearly recognized at the time, their more impactful and enduring contribution to the community was their fostering of the rapid growth of Middleborough Four Corners following the mid-nineteenth century. Despite their often quaint parochialism, both newspapers demonstrated a marked sophistication in the liberal proposals they chose to put forth and sponsor and, in the process, they became influential advocates for continued growth and modernization. Their advocacy of such advances as fire and police protection, gas lighting, street naming and numbering, municipal water and sewerage, street lighting, village beautification, and the formation of a national bank at Middleborough, was largely responsible for the ultimate realization of these and innumerable other projects. These two like-minded newspapers, or more correctly the informal fraternity they together formed, served as a unified conscience for the community - a role made possible by increasing denominalization within the community and the fact that no single church could continue to speak for the entire community. The Gazette and the News alternately persuaded, cajoled, shamed, ridiculed, needled and inspired residents to action. In one such instance, the Gazette in 1856, after reporting the various municipal improvements of surrounding communities, challenged, "Who will suggest improvements in Middleboro?" The Gazette and its sister News would and did. Throughout the post-bellum era, Middleborough's newspapers would set the local political agenda, while directing and fostering the economic growth and social maturation of the community. Together, they would define the face of modern Middleborough. That was their enduring legacy.